Packaged in canvas bags of 200 ($100 face value per bag; 71.5 oz silver content). However, circulated 90% silver coins are still traded as an investment product around the world. These coins are sometimes referred to as “junk silver” because they are in circulated condition, but make no mistake: they are a wise investment, indeed. If you put away a paper $100 bill in 1965, you’d still have $100; but a bag of 1964 Kennedy half dollars is now worth many, many times that! These half dollars are packaged in bags of 200 coins apiece. Each tube contains $100 face value worth of coins. There is approximately 71.5 troy ounces of pure silver in each bag. 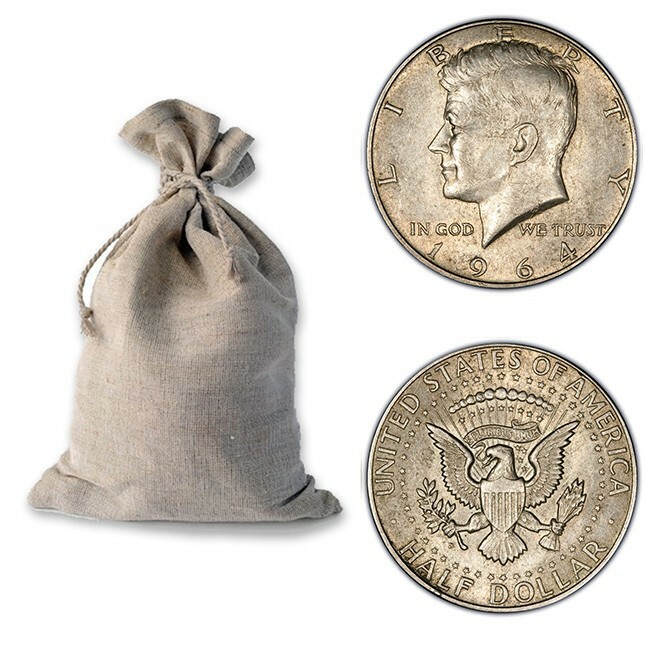 These bags are an affordable and popular way to own low premium silver. Smaller tubes of $10 face value are also available. Only $1.49 Per Oz Over Spot!